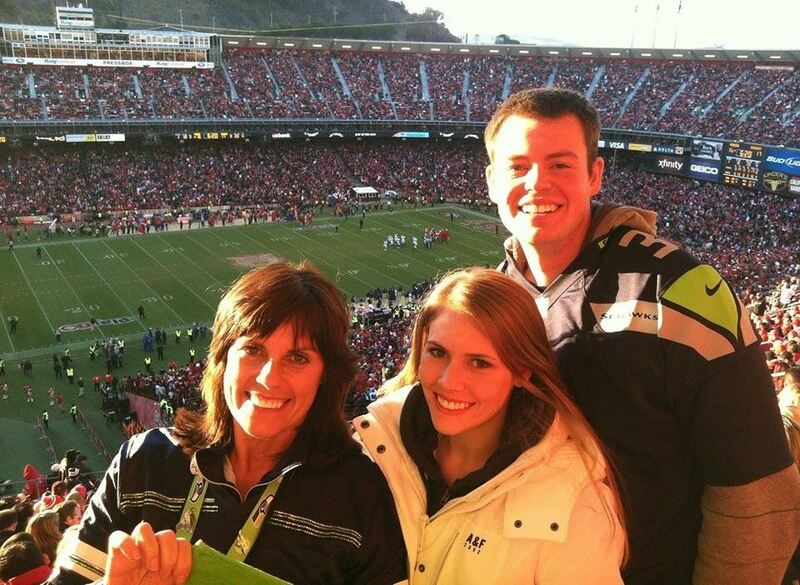 Sunday I attended the Seahawks vs. 49ers game with my family in Candlestick Park. Numerous friends and strangers warned me to be safe and be careful. I shrugged off their concern. Game day in Candlestick Park! I wasn’t worried because I’m a nice fan. I’m not one who provokes anger from the opposing team’s fans. I simply cheer for my team and its success. I don’t belittle the other team or their fans. Sadly the Niner fans take competitive bantering to the level of vulgar swearing, “in your face” insults and physical intimidation. We truly were concerned for our safety. 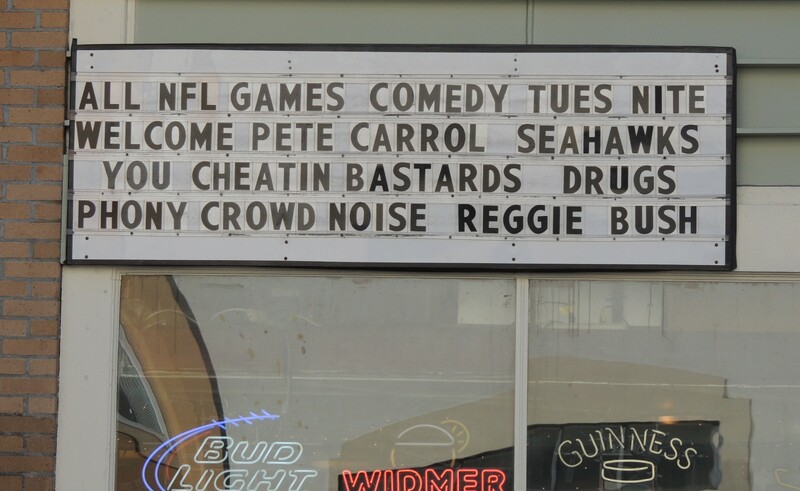 This sports bar readerboard we saw while riding a cable car typifies the classless Niner-fan mentality. 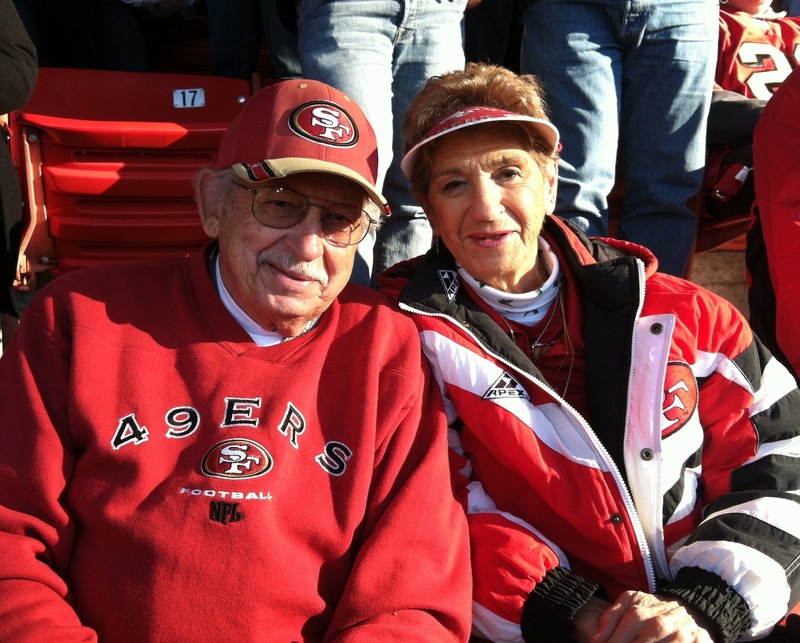 These diehard 49er fans have held season tickets for 50 years. They reflect the class of the past, and are giving up their tickets at the end of this season. Perhaps when the Niners move to their new stadium next year their fan base will change. I hope so. The sweet couple in their 80s who sat behind us Sunday are such devout Niner fans they have a “49er shrine room” in their home. They said they’ve been season-ticket holders for 50 years but are releasing their tickets after this season. They said the team and fans have changed over the years and the class is gone. The glory days when the team was led by Joe Montana have passed. So now I understand why my friends were concerned. Thankfully I believe all of the 12th Man in attendance made it out safely. Of course we were disappointed with the last-minute loss, but at least we made it out physically unharmed. Most likely the Seahawks will play the Niners in the playoffs next month, and that game will be on our turf. The 12th Man won’t have to be told what color to wear to the game, when to cheer, or when our team has scored. (“Listen for the foghorn Niner fans – that means your team has just scored.”) Really? Are they not watching the game? I could carry on with more negative Niner experiences, but I won’t. I’ll wrap up with one final thought. Hearing the SEA-HAWKS chant on our flights, throughout downtown San Francisco, in Candlestick’s parking lot and inside “The Stick” made me smile. I’m honored to represent the Seahawks and their class organization. Niners – you have some work to do. This entry was posted in Life, Seattle and tagged #12thMan, #GOHAWKS, #keepitclassy, Candlestick, football fans, Seahawks by Sheri Leonard. Bookmark the permalink.